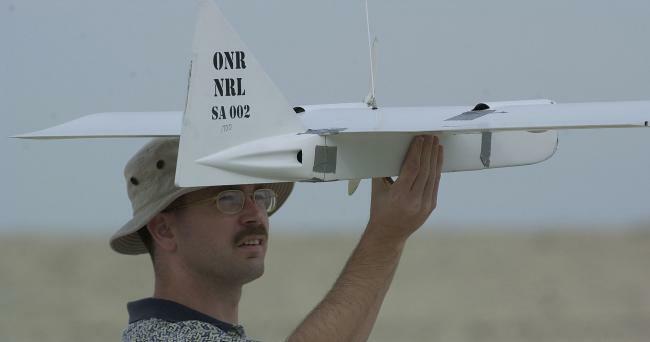 In early 2001, the Naval Research Laboratory and the Marine Corps Warfighting Laboratory designed and built the Dragon Eye hand-launched reconnaissance mini-UAV to fulfill the U.S. Marine Corps' I-SURSS (Interim Small Unit Remote Scouting System) requirement. Initial tests of prototypes by USMC units occurred in June 2001, and in July that year development and preproduction contracts were awarded to BAI Aerosystems and AeroVironment. After the evaluation of the developmental systems from both manufacturers, one of the competitors would be selected for the full-scale production contract. A Dragon Eye system consists of the three UAVs and the ground control equipment. All components are light-weight (2.7 kg (5.9 lb) for one UAV, 5.4 kg (12 lb) for the ground control station) and are carried in a soldier's backpack. The air vehicle is powered by two electric motors which drive wing-mounted propellers. It is launched either by hand or with the help of a bungee cord, and is recovered by an autopilot-controlled belly landing. The UAV has an effective operating radius of about 10 km (6 miles) and a duration of about 60 minutes. The ground control equipment includes a laptop computer, which is used to program waypoints into the Dragon Eye's GPS navigation system. The UAV can fly its mission fully autonomously, but the operator can optionally update the waypoints during the flight. The Dragon Eye is equipped with interchangeable nose assemblies which house different types of side-looking motion cameras - either full-color daylight electro-optical or low-light monochrome cameras. The camera imagery is downlinked in real-time to the operator, who uses special goggles to watch the video. Beginning in mid-2002, Dragon Eye systems were supplied to some Marine Corps units to evaluate the system under field conditions. The UAV was operationally used for the first time during Operation Iraqi Freedom in 2003 for reconnaissance and battle damage assessment. This deployment was considered a success although some weaknesses became apparent. The main problems were the lack of a zoom capability for the camera (the video images were not good enough for quick and reliable friend-or-foe identification of people on the ground) and the lack of an infrared camera option for night-time operations. In November 2003, the Dragon Eye production prime contract was awarded to AeroVironment, and the USMC's current procurement plans call for 467 Dragon Eye systems with 3 UAVs each. In early 2007, the official designation RQ-14A was finally allocated to the Dragon Eye. The RQ-14B Swift is an upgraded variant of Dragon Eye, which uses the same standardized ground control equipment as other AeroVironment UAVs, e.g. FQM-151 Pointer, RQ-11 Raven, Puma and Wasp. This variant can therefore be flown under full manual control. At least six Swift systems have been delivered to the U.S. military's SOCOM (Special Operations Command). Aerovironment and the Marine Corps are also developing a Dragon Eye Block Upgrade known as X-63 (this is not a military aircraft designation). 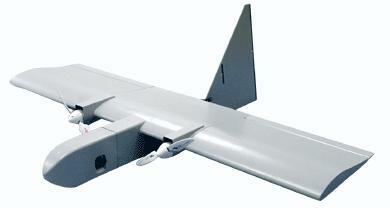 The X-63 has a larger wingspan (1.6 m (63 in)) and an improved battery for longer endurance. Additional features include improved landing accuracy and in-flight navigation, new payloads (IR and zoom cameras), and a new communications system with 8 instead of 4 up- and downlink channels. Ceiling 300 m (1000 ft) ? Endurance 60 min. 80 min.